Using the Script Editor, you can create Qt scripts for Harmony. ‣ In the Script Editor toolbar, click the New Script button. ‣ From the top menu, select Windows > Toolbars > Script Editor. Enter a name and click on OK.
‣ When working with Harmony Server, you must set the location where the script will be save, either User level, Global level, Environment level, or Job level. You can also find the help files in the Script Editor view. 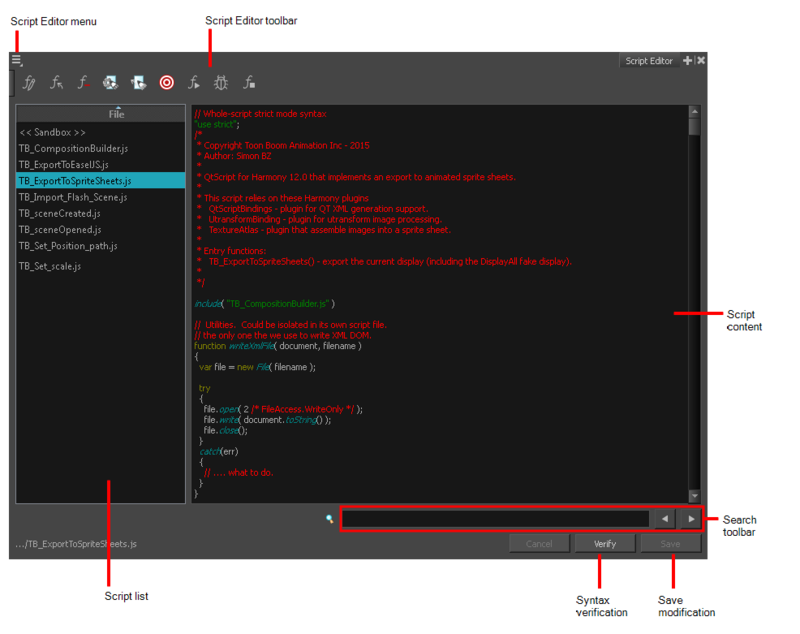 In the Script Editor menu, select Help > Scripting Interface Documentation. To test your script, select the script you want to run from the File column. ‣ From the Script Editor toolbar, click the Run button. ‣ From the Script Editor menu, select Play/Debug > Run. To avoid selecting the function every time you want to run your script, you can set a target function. In the Script Editor toolbar, click the Set Target button or select Play/Debug > Set Target from the Script Editor menu. In the Function column, select the function to target and press OK.
‣ To stop the execution of your script, click the Stop Execution button. ‣ You may receive this message: Only functions that have been saved or are explicitly called will be executed. This is because the software jumped to the <<Sandbox>> item in the Function column. The <<Sandbox>> is provided to test scripts without saving them. Simply click on your newly created script and run it again. In the Script Editor, in the File column, select the script to delete. ‣ From the Script Editor toolbar, click the Delete Script button. 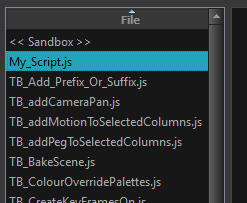 ‣ From the Script Editor view menu, select File > Delete Script. In the File list, select the script containing the function to debug. ‣ From the Script Editor toolbar, click the Debug button. ‣ From the Script Editor menu, select Play/Debug > Debug. A window opens listing the scripts and functions available. 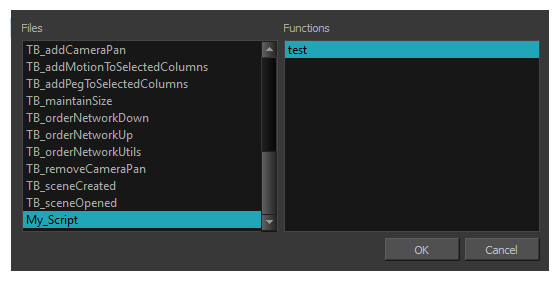 In the Functions column, select the function to debug and click OK. 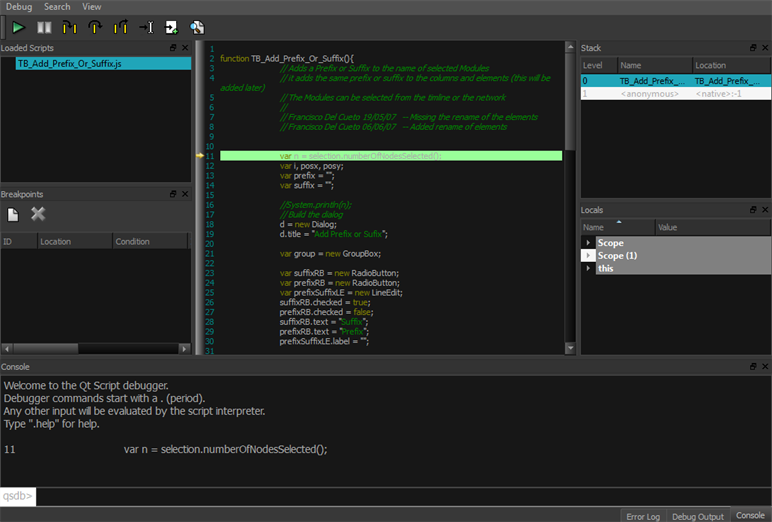 The Qt Script Debugger opens.